The 3 white-fronted and 9 pink-footed geese remained amongst the greylag flocks, up to 79 dunlin and 83 sanderling have been on the Links and long-eared owls were seen on 8th and 11th. Thrushes have been present in only low numbers but the 10th saw an increase in blackbirds with 89, and 6 song thrushes on 11th is the peak count during this time. 2 jackdaw and a meally redpoll were seen on and off, and a chaffinch and black redstart were present on 10th. Warblers included just the occasional chiffchaff, but 4 were logged after a small arrival on 13th, along with 5 blackcap, 18 woodcock and 12 robin. Finally on 15th the first little auk was seen at Bridesness, unfortunately being eaten by a great black-backed gull! 2 long eared owls were still in Holland, the woodlark was still in the stubble field by Kirbest and a yellowhammer was new. 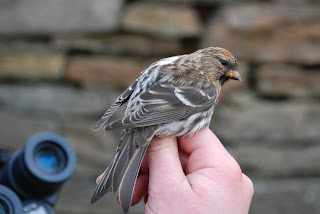 The twite flock by the Obs' held 2 chaffinch, a brambling and 2 meally redpoll. A seawatch produced little more than 3 great northern divers, 5 grey heron were at Westness and the 3 white-fronted and 9 pink-footed geese were still about. 2 short-eared owl, 128 snow bunting and a brambling were at Breck, a dunnock was at Greenspot and 8 robin were logged. Very little change with now 2 long-eared owls at Holland and a little gull at Twingness the only new birds. Also present in that area were the black redstart, grey wagtail and 2 jackdaws, whilst 8 pink-footed and 3 white-fronted geese continue to tag along with greylags by the School. 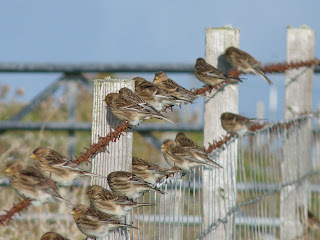 60 twite were in the bird crop by the Obs and 74 snow bunting at Sandar. The short-toed Lark had now been joined by a woodlark at Kirbest, with 2 goldfinch there also. 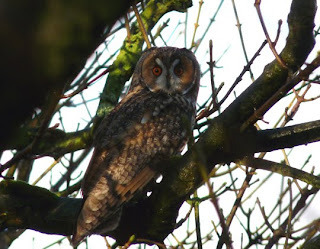 The long-eared owl was still in Holland, 3 white-fronted geese by the school and 2 jackdaw were noted. 81 sanderling in Nouster is the largest count for a while, 90 twite were feeding in the Obs' bird crop and a single wheatear and blackcap were seen. A very quiet day with 2 white-fronted and 8 pink-footed geese by the School, the scaup on Gretchen Loch and a long-eared owl in Holland. The black redstart was seen again and 11 robin and 4 woodcock were logged. The short-toed lark was still present at Kirbest as was the scaup on Gretchen Loch. 4 white-fronted geese were at Greenwall, 2 woodpigeon and 5 chiffchaff were at Holland and singles of grey wagtail and black redstart were seen. 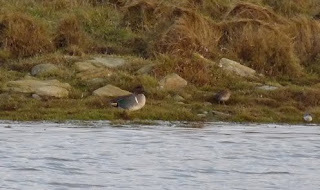 The scaup remains on Gretchen Loch and dwindling thrush totals included 172 fieldfare, 5 song thrush, and 124 redwing. 2 blackcap were at Holland, 10 robin, 11 woodcock and a ring ouzel were seen and a short-toed lark was in the stubble field at Kirbest. Also of note were 18 pink-footed geese. A great end to the month with strong southerly winds and rain overnight dumping another batch of thrushes and some pretty unusual birds too. A great grey shrike by the Observatory was a good start to the day and the long-eared owl and little bunting were still at Holland. 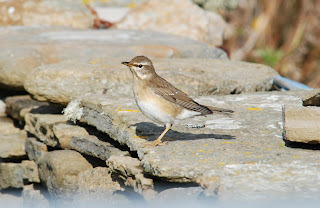 Unseasonal sightings included a flava wagtail on the airfield, a whinchat at Garso and a swallow at Bewan. Woodcock were still in good numbers with 39, thrushes consisted a ring ouzel, 174 blackbird, 636 fieldfare, 21 song thrush and 175 redwing. 17 robin and 5 black redstarts were noted, just a lesser whitethroat, 5 chiffchaff, a blackcap and 2 goldcrest were at Holland a scaup was on Gretchen Loch. The day finished nicely when a stunning woodlark was discovered at Westness, just the 3rd island record, the last being in March 1998. Woodcock were more evident with 33 logged, a black redstart was by Gretchen and a ring ouzel at Trebb. A confiding little bunting and a long-eared owl were at Holland and other notable migrants involved just 1 chiffchaff, 1 blackcap and 4 robin. A big clear out of thrushes but smaller migrants included 16 robin, 11 blackcap, 6 chiffchaff, and singles of dunnock, black redstart, Grey Wagtail and goldcrest. The drake green-winged teal was still on Gretchen Loch and 110 twite remained in the Ob's bird crop with a greenfinch and 2 chaffinch. Undoubtedly one of the best days of the autumn with a good selection of migrants, and another good arrival of thrushes with 491 blackbird, 1046 fieldfare, 238 redwing, 23 song thrush and a ring ouzel. Woodcock were also in good numbers with 45, mist netting boosted a few totals such as 17 robin, 8 chiffchaff, 8 goldcrest and 15 blackcap. 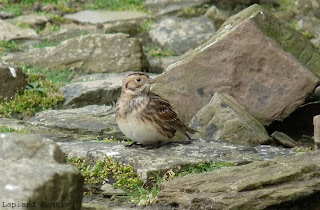 Single willow warblers were at Gravity still and Nether Linnay, with a little Bunting also at that site. 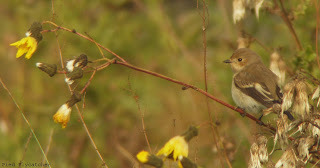 120 twite are now in the Obs' bird crop, 220 snow bunting is a good count and the goldfinch was seen at Westness. Singles of both long and short-eared owl were seen, the stock dove was still present as were 2 jackdaw, and 4 black-redstarts were scattered around. The day was finished off nicely when the island's 4th record of green-winged teal was found on Gretchen Loch, and a richard's pipit at Ancum. Very quiet with hardly any thrushes left. 3 rook flew over in the morning, a black redstart was at Twingness and the jackdaw was seen again. Migrants included 8 woodcock, 4 goldcrest, 7 chiffchaff, 20 robin, a lesser whitethroat and 2 blackcap. A grey plover was on the Links, a collective total of 104 twite is the best for many years and bird of the day went to a goldfinch at Rue. 2 shelduck appeared on Gretchen Loch, 6 pink-footed geese were amongst greylag flocks and still present were the jackdaw, stock dove, 3 woodpigeon and now 2 black redstarts by the Obs'. A much calmer day than of late no doubt lead to an increase in smaller migrants with 33 robin, 3 dunnock, 6 chiffchaff and 3 goldcrest. A ring ouzel was at the north end and other thrushes included 276 fieldfare, 20 song thrush, and 233 redwing. 16 woodcock were logged, a very late wood sandpiper was at West Beach and 6 jack snipe were booted from around Bridesness. 6 whooper were still on Gretchen Loch, the yellowhammer still at Nether Linnay and 1 stock dove remains. A grey wagtail and black redstart were around Twingness, and thrushes included 208 blackbird, 557 fieldfare, 22 song thrush and 339 redwing. 5 brambling were in the Obs' bird crop and other bits consisted a dunnock, 19 robin, 5 blackcap, 4 chiffchaff and 2 goldcrest. A slightly quieter day with redwing the only thrush in larger numbers with 563, goldeneye and long-eared owl are both firsts of the autumn and the first yellowhammer of the year was at Nether Linnay. 7 whooper swans were new on Gretchen Loch, the twite flock in the Obs' crop is now at 80+ birds and 3 woodpigeon and 2 stock dove are still present. There were more robins today with 25 logged, 16 woodcock were seen and the sparrowhawk, 5 blackcaps, dunnock and lesser whitethroat were in Holland. The sparrowhawk, a goldcrest, 4 blackcap, lesser whitethroat and 3 chiffchaff were at Holland, woodcock were still in good numbers with 42 and 5 jack snipe were seen. A jackdaw and 3 stock doves are both uncommon island records, 4 woodpigeon were in the south and 19 robins is an increase. Thrushes consisted 249 blackbird, 1028 fieldfare, 39 song thrush, and 332 redwing, and 15 long-tailed ducks were scattered around the island. A fresh arrival of birds today but conditions were far from helpful. Most notable increases were woodcock with 45, and blackbird with 472, whilst other thrushes consisted 2 ring ouzel, 670 fieldfare, 29 song thrush and 990 redwing. Small migrants were still in short supply with a blackcap and yellow-browed warbler along the west dyke, the dunnock at Holland, 10 robin and a meally redpoll. As always with strong winds gull flocks scattered across the island included 1630 herring gulls and 504 great black-backed gulls. Disappointingly quiet given the conditions with fewer thrushes and just singles of dunnock, robin, lesser whitethroat and goldcrest. 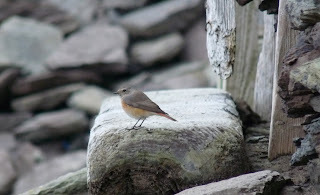 The only new arrival was a redstart at Gue Park. Thrushes were still fairly abundant with 500 fieldfare, 359 redwing, 64 blackbird and a song thrush, but smaller migrants are still thin on the ground with just 5 robin, a lesser whitethroat, 3 blackcap, 2 chiffchaff, a willow warbler and a goldcrest. Once again 8 hen harriers went to roost at Hooking Loch, and 3 meally redpoll and 2 jack snipe were present. 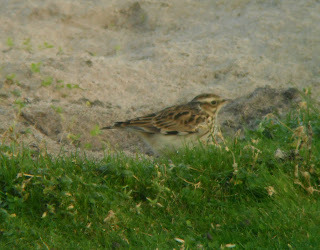 A similar cast to recent days with the bluethroat and tree pipit still at Gravity, and the whinchat still by Scotsha. 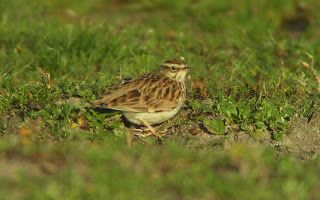 A short-toed lark was discovered amongst skylarks at Kirbest, with 2 lapland buntings there also. 23 brambling was the only real increase, with 1 woodcock, 4 blackcap, 4 robin, lesser whitethroat, 2 greenfinch and 5 common redpoll also noted. 2 sooty shearwater were seen from the north end and 8 hen harrier went to roost at Hooking Loch. A new arrival of thrushes consisted mostly fieldfare with 766, as well as 229 redwing and 3 song thrush. A first winter CITRINE WAGTAIL found at Garso was the undoubted highlight, and a total of 8 hen harriers going to roost at Hooking Loch is well worth a mention. 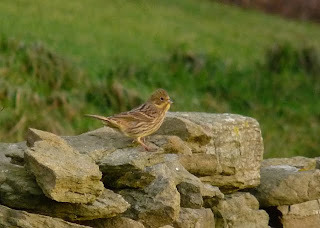 Other notable sightings were 3 meally redpoll and a tree pipit. One or two new migrants included a late whinchat at Scotsha, a stonechat at Howar, and a sparrowhawk trapped at Holland. The day livened up when a little egret was spotted flying over Hooking Loch heading south. 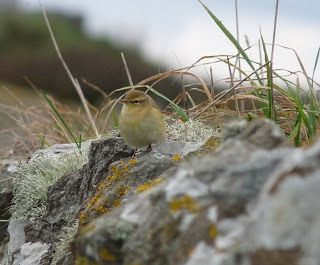 This is a long overdue first for the island and was unfortunately not seen again despite much effort. In search of the egret another HORNEMANN'S ARCTIC REDPOLL was discovered at Kirbest, 5 common redpoll of sorts were also seen and the bluethroat remains. 2 new blackcaps and a lesser whitethroat were trapped at Holland, 51 twite were in the Obs' bird crop and long-tailed ducks in Linklet bay had risen to 24. Little of note today but for the bluethroat at Gravity, and most migrants were in lower numbers with just 4 each of goldcrest and chiffchaff, 3 blackcap and 4 robin. 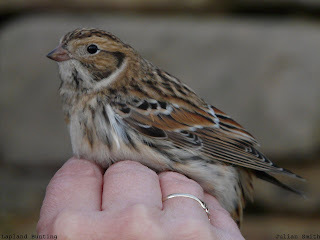 3 north western redpolls were seen and 6 long-tailed ducks were in Linklet Bay. Redwings had increased a little with 348, a short-eared owl at Breck is amazingly the first sighting this autumn, and a bluethroat is at Sangar. 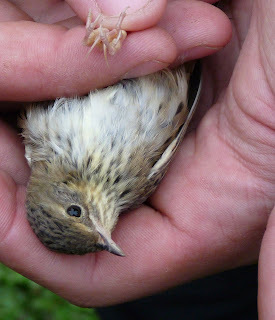 Finches in the Obs' bird crop consisted 36 linnet, 31 twite and 11 brambling, a willow warbler and a garden warbler were trapped at Holland and other bits included 1 dunnock, 6 robin, 4 lesser whitethroat, 2 blackcap and 8 goldcrest. Migrants appeared to be dropping in through the day with more thrushes present, 76 blackbird, 218 fieldfare, 6 song thrush, and 216 redwing. Holland gardens held a yellow-browed warbler plus the majority of small migrants with 6 robin, 3 blackcap, 5 chiffchaff, 5 goldcrest. 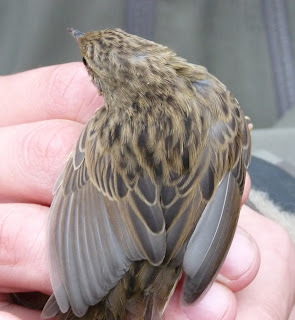 6 woodcock were logged, a late tree pipit was by the Kirk and single woodpigeon and meally redpoll were trapped. 2 jack snipe were at Westness and finches included 6 brambling, 1 greenfinch, and a chaffinch. 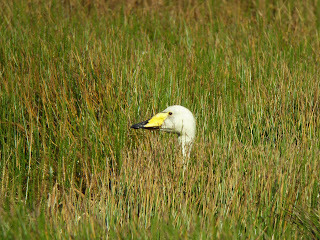 There were clearly new birds in but with heavy rain all day birding was near impossible! Fieldfare were more abundant with 142 logged, plus 1 ring ouzel, 55 redwing and a song thrush. A jack snipe was in Kirbest Mire and small passerines consisted 7 goldcrest, 2 blackcap, 2 robin, 2 dunnock and a chiffchaff. A fine and calm day with a light scattering of new migrants, small twite flocks were heading south with a day total of 49 and snow buntings were up with at least 179. Netting at Holland boosted common migrant numbers which were 48 redwing, 5 song thrush, 27 fieldfare, 18 goldcrest, 5 chiffchaff, 5 blackcap, 4 dunnock, a redstart, 9 robin, 4 brambling, 5 chaffinch and 6 greenfinch, whilst scarce migrants included a bluethroat at Sangar and a common rosefinch at Rue. Late afternoon produced the highlight when a LANCEOLATED WARBLER was found near the Observatory, the nearby heligoland trap was literally held together and the bird was consequently trapped and processed representing the 2nd North Ronaldsay record. 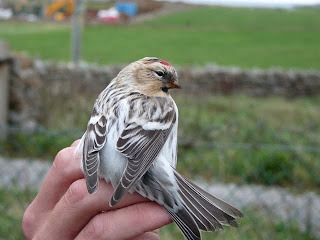 Golden plover numbers remain reasonably high with 600 today and 2 north western redpolls were hanging around the Obs'. No sign of the kite today but still a fair few migrants, though thrushes were less abundant with 366 redwing, 16 song thrush, just 9 fieldfare and a ring ouzel. A yellow-browed warbler was at Cott Banks, an eastern chiffchaff was by the Obs' late afternoon and a woodcock was at the surgery. 2 male hen harriers were present during the day and other migrants consisted 2 woodpigeon, 1 dunnock, 9 robin, a redstart, 7 blackcap, 1 willow warbler, 8 goldcrest, 4 chaffinch, 2 brambling, 6 greenfinch and 25 twite. A fresh south easterly wind was a long awaited autumn first and finally produced some birds! The vast majority being thrushes with 3155 redwing, 126 song thrush, 50 blackbird, 56 fieldfare and 7 ring ouzels. 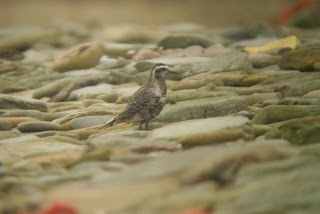 The first woodcock was seen by Kirbest, a grey wagtail flew through, then in the afternoon a surprise find at Nether Linnay was North Ronaldsay's first ever red kite. Other migrant totals were 6 grey heron, 6 robin, 3 blackcap, a redstart, 4 chiffchaff, 7 goldcrest, 3 chaffinch, 10 brambling and a greenfinch. Bird of the day was a frustratingly brief view of a red-breasted flycatcher type at the Surgery, with a common redpoll there too. A male hen harrier was floating around, the yellow browed warbler was still at Bridesness and 4 jack snipe were in Kirbest Mire. A robin, 6 redwing, 2 chiffchaff and a fieldfare were in Holland. At Kirbest Mire 3 jack snipe were seen, and 188 snipe logged is the highest total so far this autumn. A chiffchaff was in Holland and just singles of redwing, song thrush and fielfare were noted. Yet again a HORNEMAN'S ARCTIC REDPOLL was seen, this time over at Hooking with 2 rostrata common redpolls, and makes you wonder just how many individuals have been involved here so far this October!? An oddly quiet day following yesterday's arrival, with just 8 redwing and sadly no eyebrowed thrush. 3 jack snipe were at Westness, a garden warbler was at the surgery other migrants of note included just 2 robin, 1 song thrush, 2 brambling, single willow warbler and chiffchaff, and 65 snow and 1 lapland bunting. The EYEBROWED THRUSH was soon located in the morning despite a good southward passage of redwings from first light, with 1700 through by 9am. It showed well early morning, but soon became mobile as the weather worsened and was last seen early afternoon. A grey wagtail flew south, autumn firsts included 4 ring ouzel, 3 brambling, and a long-tailed duck and 3 jack snipe were around Bridesness. Redwings were well scattered with a conservative 556 grounded birds logged, a yellow-browed warbler was by Brides Loch, a chiffchaff and blackcap in East Loch Park and 9 song thrushes. A HORNEMAN'S ARCTIC REDPOLL was seen at the north end, by Rue, and 2 great northern divers flew over. Click HERE for a video of the Eyebrowed Thrush. An EYEBROWED THRUSH seen briefly mid morning by Holland House was thankfully relocated near the Observatory later in the day, where it showed well until dark and becomes the first record for North Ronaldsay. Amazingly the only other thrushes besides blackbirds today were a fieldfare, a song thrush and 3 redwing. 4 barnacle geese were by The Kirk, a hen harrier was seen and trapped at Holland were 2 rostrata common redpolls, a chiffchaff and a willow warbler. 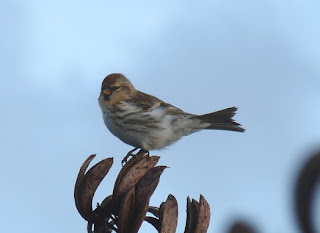 Very little of note with the 2 rostrata common redpolls still at the Surgery and a 3rd at Greenwall. The chaffinch was still at Nether Linnay, 3 redwing were around Holland and a yellow-browed warbler was found fresh dead along the east dyke. 2 rostrata common redpolls were in the surgery garden and at Holland were 2 robins, a single chiffchaff and willow warbler. 2 HORNEMAN'S ARCTIC REDPOLLS were in Nether Linnay area, with a chaffinch, lesser whitethroat and goldcrest also there. 21 sooty shearwater passed at sea and 5 lapland buntings were seen. A new HORNEMAN'S ARCTIC REDPOLL was seen coming in with 8 north western redpolls at West Beach, before residing in the Obs' bird crop, and the wryneck was still hanging on at Neven. Calm weather again produced some good seawatching mid-day with 1471 fulmar including 13 blue, 73 sooty shearwater, 1 large shearwater sp., 76 manx shearwater, 2 adult pomarine skuas and 705 kittiwakes in 2 hours. The redstart was again at Ancum, 4 lapland bunting were at Westness and 3 greenfinch in Holland, other birds on note included 11 red-throated and 2 great northern divers in Linklet Bay, 101 snow bunting, 2 willow warbler, a chiffchaff, a blackcap and single redwing and song thrush. A quiet day really but the wryneck appeared again at Neven, a robin, a willow warbler and a chiffchaff were in Holland, a lapland bunting was by Bewan the rostrata common redpoll still on the Links. 2 grey plover were at Bridesness, 2 merlin and a peregrine were seen and seawatching produced a pomarine skua and 27 sooty shearwater of note. Another productive seawatch this morning with highlights being a balearic shearwater and a great shearwater, plus 65 sooty and 30 manx shearwater. Amongst the 759 fulmars logged were 3 blue, and 3 arctic skuas flew west. The HORNEMAN'S ARCTIC REDPOLL appeared at Sangar late on but fairly quiet elsewhere with just a single chaffinch, a chiffchaff and the first 2 redwing of the autumn. The first calm day for some time produced a reasonable sea passage including 2 large shearwater sp., 37 sooty shearwater, 106 manx shearwater, 641 fulmar including 3 blue, and 517 kittiwake. 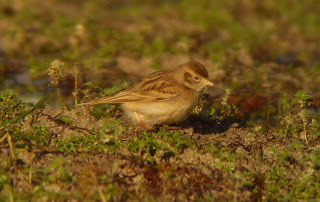 On the land were notably more snow buntings with at least 97, and 1 lapland bunting. A carrion crow , greenland common redpoll and redstart are new, 2 grey plover were on the Links, 4 barnacle geese flew through and finally, an afternoon netting session at Holland produced a very smart HORNEMAN'S ARCTIC REDPOLL. A small number of greylag geese were on the move with 243 through, along with 83 pink-footed geese and 13 whooper swans. Holland held 3 willow warbler, 2 robin, a chiffchaff, blackcap and lesser whitethroat still plus the first chaffinch of the autumn. More notable sightings were of a pomarine skua at the north end and a little stint on Gretchen Loch. A reasonable pink-footed goose passage with 1536 in total, plus 12 whooper swans. Very little change elsewhere with the yellow-browed warbler, robin, lesser whitethroat, blackcap and chiffchaff at Holland and the sand martin at Bridesness. The day total of 68 wheatear was a clear increase and 3 lapland buntings were by Bewan. No sign of the plover today but a better day than expected given the conditions. The first yellow-browed warbler of the autumn was in Holland gardens, with a blackcap, lesser whitethroat, chiffchaff, robin and 2 willow warbler also, and in the afternoon a little bunting was discovered at Ancum. 45 pink-footed geese flew south as did 3 twite, 2 sand martins were over Brides' Loch and singles of merlin and peregrine were noted. The american golden plover was still at Bridesness in the afternoon and a slavonian grebe was seen in Linklet Bay, otherwise a very quiet day but for a stonechat and a few snow buntings. 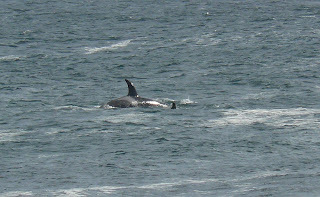 A 3 hour seawatch in the morning produced most notably a pomarine skua, 19 sooty shearwater, 1071 fulmar and 882 gannet. The wryneck was still at Neven and in the afternoon we finally got some reward for a desperate September of westerlies; an adult american golden plover, seen flying over Brides' Loch and soon relocated at Kirbest. 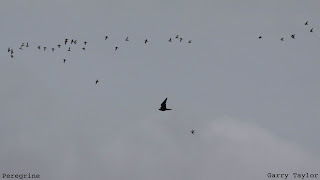 117 pink-footed geese flew through and 2 sand martin were over Brides' Loch. The wryneck was still at Neven and passerine migrants included singles of lesser whitethroat, garden warbler and willow warbler plus 3 lapland and 17 snow buntings. 284 pink-footed geese flew south through the day, a peregrine was seen and passing at sea were 2 sooty shearwater, 3 manx shearwater and a storm petrel. Surprisingly 2 wrynecks were seen today at Neven and Haskie, previously assumed to be the same bird and not seen since the 13th. In nearby Linklet Bay were a common tern and the grey plover, and wildfowl overhead included 104 pink-footed geese, 4 whooper swan and 2 pale-bellied brent geese. 6 sooty and 1 manx shearwater passed at sea and a peregrine was seen. 6 sooty shearwater were seen from the north end whilst 123 pink-footed geese flew through in bits through the day. 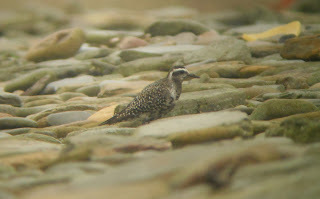 A whimbrel was at Bewan along with 14 snow buntings, the grey plover remains in Linklet Bay whilst at Holland were a robin, 2 willow warbler and a chiffchaff. A stonechat was at Ancum. Holland gardens typically held the majority of migrants including the first song thrush of the autumn plus 2 chiffchaff, 1 willow warbler, 1 robin and the pied flycatcher still. A blackcap and a stonechat were by the Observatory, a sand martin was at Holland, 23 pink-footed geese flew through and 3 lapland buntings were seen. Still at Holland were the pied flycatcher, 2 willow warbler, a chiffchaff and a lesser whitethroat, plus another of the latter at Roadside Stores. A grey plover was on the Links, the male hen harrier again at Hooking and 3 grey heron were seen. Seawatching was slower than recent days with just 5 sooty and 9 manx shearwater, 253 fulmar including 1 blue and 10 great skuas. Great shearwater was again the highlight with a single bird passing west in the morning, and even closer than the previous few. Other seawatch counts were 1343 fulmar, 17 sooty shearwater, 14 manx shearwater, 299 gannet and 315 kittiwake. A common rosefinch was at Ancum, two firsts of the autumn included a robin trapped at Holland and a jack snipe in Kirbest Mire. A chiffchaff was in East Loch Park, a lesser whitethroat, blackcap and pied flycatcher in Holland and 3 willow warbler were logged. A 4 hour seawatch was rewarded with 2 close great shearwaters heading west, with other totals being 36 sooty and 46 manx shearwater, 1515 fulmar, 309 gannets, 205 kittiwakes and 80 pink-footed geese in. 3 lesser whitethroat and a lapland bunting were seen, a chiffchaff and 2 willow warbler were at Holland and divers included 7 red-throated and 2 great northern. The pectoral sandpiper was still on Gretchen Loch but otherwise a pretty quiet day with a blackcap at Scotsha, a willow warbler at Holland and 2 lesser whitethroat, plus a lapland bunting at Kirbest and 2 snow bunting at Bewan. 31 sooty and 67 manx were logged on a morning seawatch, 2 snow buntings by Bewan are the first of the autumn and a pectoral sandpiper was on Gretchen Loch. 88 knot and a grey plover were at Haskie and the male hen harrier was at nearby Hooking. A stonechat was at the Obs', and 3 lesser whitethroats and a willow warbler were seen. Seawatching featured for a good part of the day and produced the best totals so far this autumn, the best bits being a cory's shearwater in the morning and a great shearwater early afternoon, plus 97 sooty shearwater, 118 manx shearwater, a leach's petrel, 301 kittiwakes and the first 26 pink-footed geese of the autumn. 2 pectoral sandpipers were on Kirbest Mire and common migrants consisted of 2 lesser whitethroat, 1 whitethroat, a pied flycatcher, a stonechat and 5 willow warbler. 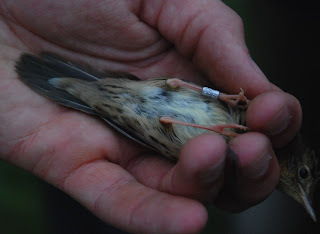 2 barred warblers included a bird at the Surgery and a 2nd trapped at Holland, where unusually a smart lapland bunting was trapped and ringed in the evening. Also noted were 5 great northern divers and 2 merlin. 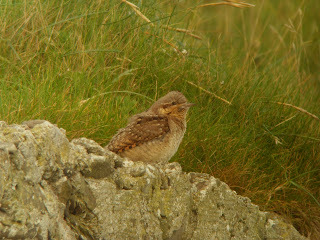 7 storm petrel, 21 sooty and 21 manx shearwater were seen at sea, the wryneck had moved along the golf course to Neven and the crossbill was in East Loch Park. 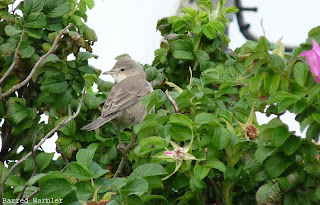 A garden warbler and 3 willow warbler were in Holland, a whinchat was at Rue and a white wagtail at Twingness. A common tern and a redpoll flew over the Obs' in the afternoon and also seen today were a peregrine, red-breasted merganser, 1 black-tailed and 32 bar-tailed godwit, the grey plover and 135 arctic terns. A quieter day worsened by some pretty awful weather through the morning. 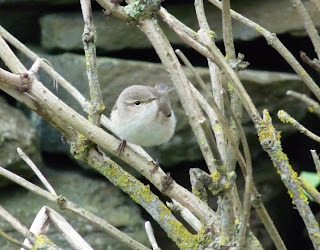 A lesser whitethroat at Westness was new, a garden warbler was in Holland and a total of 5 willow warbler were seen. The grey plover was still at Haskie and the crossbill in East Loch, a merlin and the hen harrier were around Hooking and 170 teal were on the loch there. Holland gardens still held 2 willow warbler and a garden warbler, with another of the latter at Scotsha. A pied flycatcher was at the surgery, singles of willow warbler and crossbill were in East Loch Park and a grey wagtail around Twingness. An adult black tern at Haskie in the afternoon was bird of the day on a local level, the last island record being 2003, and also there were the wryneck and 4 pale-bellied brent geese still. Other sightings through the day included 3 grey heron in Garso Wick, a grey plover, merlin, peregrine and a male hen harrier. The wryneck was still along the beach at Haskie, as were the 4 pale-bellied brent geese briefly. 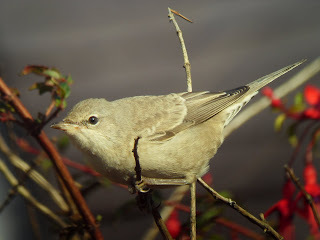 3 willow warbler and a pied flycatcher remain at Holland and the barred warbler appeared again at Roadside. 8 sooty and a single manx shearwater were seen off the north end, 4 red-throated divers were in Linklet Bay and 114 sanderling an a grey plover were on the Links. Still present at Holland were the barred warbler, 2 pied flycatcher, 2 willow warbler and a garden warbler plus the whinchat was still in East Loch Park. 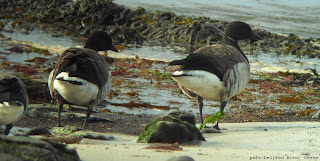 A blackcap was at Ancum and a wryneck at Hooking is surely undiscovered remnants from the weekend, whilst 4 pale-bellied brent geese at Bridesness are a decent island record. A morning seawatch wasn't much use and produced just 1 sooty shearwater of note, 244 wigeon and 7 pintail were at Ancum and migrants included 4 willow warbler, a whinchat, a pied flycatcher, a barred warbler at Holland and the first lapland bunting of the year was sheltering by the dyke at Twingness in the afternoon. Leftover migrants today were a little harder to come by with an increasingly strong westerly wind, but barred warblers were still in the gardens of Roadside Stores and Holland, with the latter site also holding 2 pied flycatcher and 6 willow warbler, and a crossbill was in East Loch Park. 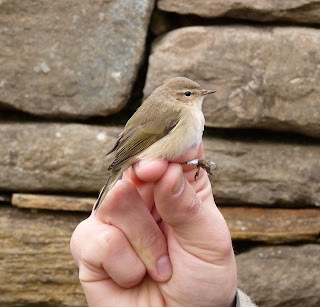 2 willow warblers and a pied flycatcher were at the Obs', with all other migrants being at Holland, including 2 pied flycatcher, a garden warbler and 8 willow warbler. 2 peregrines flew over and a merlin was present. Mist netting at Holland produced a reed warbler amongst other things, with a single barred warbler there and a 2nd still at Roadside Stores. A redstart was at the Obs', a whitethroat at Lindswick and other common migrant totals were 13 willow warbler, 7 garden warbler, 3 blackcap, 6 pied flycatcher and 4 whinchat. 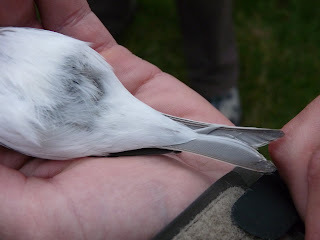 One of the summering chiffchaffs was also re-trapped at Holland, and a late sandwich tern was in Linklet Bay. Last night's poor weather resulted in a fair spattering of common migrants as hoped, including 3 barred warblers at Holland (2) and Roadside Stores (1). 2 tree pipits and singles of lesser whitethroat, whitethroat and blackcap were the first of those species this autumn, and other passerines being 5 garden warbler, 11 willow warbler, 2 redstart, 8 pied flycatcher and 3 crossbill. 3 grey heron came in, 4 ruff were amongst the golden plover, a flock of 33 black-tailed godwit at Bewan is a good island count and snipe were more abundant today with 82 logged. A quiet morning with just a sooty shearwater and 3 manx shearwater seen at sea, 3 black-tailed godwit on Bewan Loch and a whimbrel at Bridesness was followed by relentless heavy rain from midday onwards. A few bedraggled migrants around the Obs' late on included at least 1 redstart, a greenshank, 2 willow warbler, a garden warbler and 6 crossbills, hopefully a sign of things to come tomorrow. Mist netting at Holland produced just a garden warbler and a willow warbler, and just a single sooty and 9 manx shearwater were seen at sea. 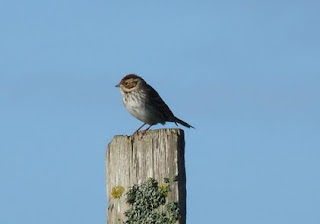 A merlin and collared dove were seen in the south of the island and a whinchat was at Scotsha. Grounded migrants were still in short supply but did include a common rosefinch at Holland, as well as 4 white wagtail, a garden warbler, 3 willow warbler, a pied flycatcher and 5 crossbill. Sea passage consisted of mostly fulmars with 1658, plus 6 sooty shearwater and 87 manx shearwater. Seawatching again featured through the day and provided the days birding highlight in the form of a very close great shearwater, plus totals of 1827 fulmar, 20 sooty and 161 manx shearwater, 111 storm petrel, 380 gannet and 199 kittiwake. 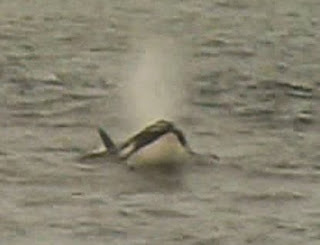 After a distant sighting early morning a pod of 4 killer whales spent over an hour seemingly playing around Seal Skerry before heading out northwest. A garden warbler and 2 willow warbler were at Holland, with 3 more of the latter elsewhere, an unstreaked acrocephalus warbler was seen briefly in the Obs' kale crop and 8 crossbills were at Westness. 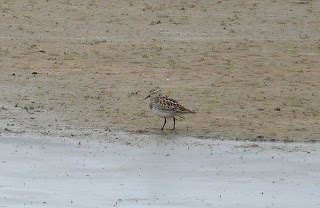 Other sightings included 3 ruff by the school, 3 black-tailed godwit and 5 whimbrel. Migrant passerines were still thin on the ground with a willow warbler and a pied flycatcher at Holland and 3 crossbill, and waders included a black-tailed godwit, 3 ruff and 53 knot. The day became much more exciting at lunchtime when 4 killer whales spent a short while off the north end, and the totals of 5 hours seawatching are as follows; 314 gannet, 1253 fulmar, 5 sooty and 109 manx shearwater, 165 storm petrel, 1444 kittiwake, 18 great skua, and 5 whimbrel came in. 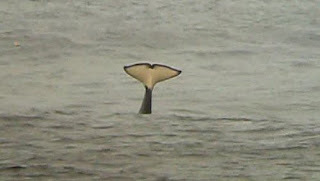 Other sighting included a single great northern and 2 red-throated divers, 690 golden plover and a grey heron. Another quiet day with single willow warblers at Holland and Sennes, 2 ruff on Gretchen and a black-tailed godwit was seen. 26 knot were on Sandsheen and 2 sooty shearwater flew past the north end. The best of an unpleasant day's birding weather wise included 3 willow warblers at Nether Linnay, garden warblers at the Obs' and Gretchen and a single crossbill. 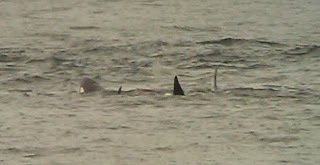 Seen on a seawatch were 1 sooty shearwater and 6 manx shearwater. Mist netting at Holland produced 2 garden warbler and 2 willow warbler, with 2 more of the latter elsewhere. 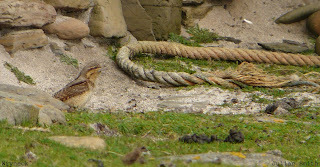 Whinchats were seen at Kirbest and Senness, a barred warbler was at the Shop and a sedge warbler was in the Obs' crop. Notable waders consisted of 3 greenshank, a green sandpiper and the grey plover still at Haskie. Also seen were 5 white wagtails, 2 crossbill, a swift and 5 sand martin. A handful of migrants today included 4 willow warbler, 2 whinchat, a crossbill and the first pied flycatcher of the autumn were at Breck. 9 black-tailed godwit and 2 grey heron were at Ancum, 3 whimbrel flew through and a swift was by Hooking. 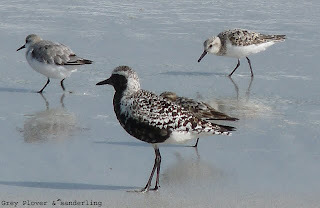 The grey plover, 150 sanderling and 136 ringed plover were on the Links. A whinchat was in East Loch Park, a willow warbler was by the Obs', a crossbill flew over and a chiffchaff was trapped at Holland. A corncrake was later flushed near Gretchen Hide, the grey plover was still in Linklet Bay and a barred warbler was at Southness. An early fieldfare in the morning was quite unexpected, a greenshank was on Bewan Loch and the cuckoo was at Rue. Things picked up a little in the afternoon with 2 garden warbler at Ancum, a sedge warbler at the Obs' and a light southerly passage of crossbills, 29 in total. 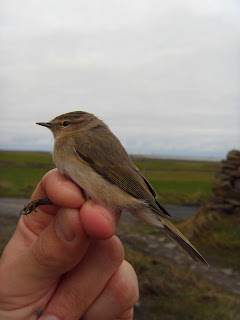 The first barred warbler of the autumn was at Kirbest in the evening and a whinchat appeared in the obs' crop. A grey plover was in Linklet Bay, a noticeable increase in wildfowl included 103 wigeon and 7 pintail on Ancum Loch and singles of merlin and hen harrier were seen. Other counts included 2 each of whimbrel and black-tailed godwit, a swift, 2 white wagtail, 307 meadow pipit and a willow warbler. The strong south easterly winds didn't produce as hoped, with just 3 willow warblers the only passerines of note. A juvenile cuckoo at Holland is presumably last week's individual, a greenshank flew along the west side and 2 ruff were in Mid Park. A distinct increase in migrant wheatears and meadow pipits today with 150 and 147 respectively, and alba wagtails were more abundant including at least 4 white wagtails. Notable waders included a whimbrel, 2 black-tailed godwit and a count of 47 snipe is the highest total this autumn. The buzzard was still present as were the 2 crossbills and 2 willow warblers were present. 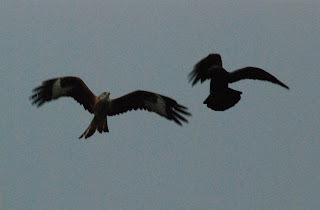 A selection of raptors today included most notably a common buzzard, plus single merlin, kestrel and peregrine. The 7 ruff were still with the golden plover flock, a greenshank was seen and in Nouster Bay were 205 sanderling. 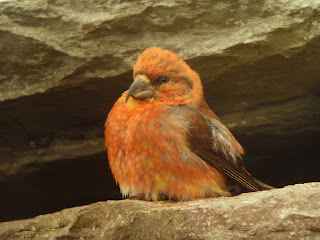 2 crossbill and a swift were seen by the Obs' and 3 collared doves were at Holland. A whimbrel was along the west side, 2 willow warblers were in East Loch Park, 2 pintail were on Ancum Loch and 7 ruff were amongst the golden plover flock. A very quiet day with little more than a hen harrier and a grey heron. An hours seawatch produced 450 kittiwakes, 2 sooty shearwater, 15 manx shearwater, 14 storm petrel and 249 fulmar. 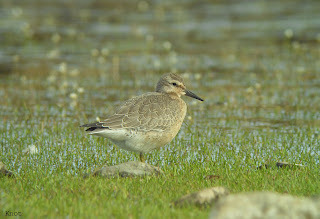 3 ruff were amongst the golden plover flock, a green sandpiper flew over and a juvenile cuckoo was by Vincoin. The greenshank was still present, a kestrel was seen at Verracot and 2 whimbrel flew over. 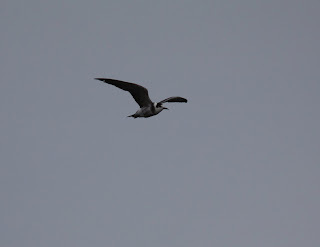 A greenshank was on Gretchen Loch breifly and a total of 20 ruff. A swift was at Hooking, 2 collared doves were at Howar and 2 willow warbler were seen. Seawatching provided most of the days interest with notably 40 manx shearwater, 3 sooty shearwater, 35 storm petrel, 548 fulmar and 174 gannet in an hour. A merlin was at Rue, a ruff and greenshank were on Gretchen Loch and willow warblers were at the Obs' and Holland. A black-tailed godwit and 3 ruff were on Gretchen Loch, 3 collared doves and a willow warbler were at Holland and at least 700 arctic terns were roosting in Nouster Bay. Wheatear numbers had notably increased with 37, a whimbrel was by the school and at Westness were 17 knot and 3 grey heron. 1 of yesterdays hen harriers was still present, 2 ruff were on Gretchen and 169 sanderling on the Links. Pied wagtails were much more abundant with 45, a green sandpiper flew over and 3 whimbrel and 2 willow warbler were seen. 2 juvenile hen harrier and 5 water rails were seen at Ancum Loch, a ruff and a black-tailed godwit were on Gretchen and the collective total for dunlin was 101. 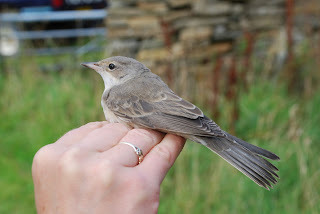 A willow warbler was at the Surgery and 9 swift were over the Obs' late evening. Also seen were 2 grey heron and 2 whimbrel. 3 ruff and black-tailed godwit were on Gretchen were a peregrine flew through and a green sandpiper was flushed from the coast by The Lurn. 2 whimbrel were at West Beach, 843 golden plover is the highest count this summer and 2 collared dove and 3 willow warbler were seen. The first sooty shearwater of the summer was seen passing the north end, along with 4 manx shearwater and 12 storm petrel. 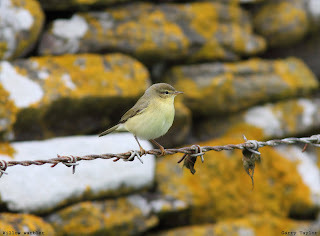 Willow warblers were at the Surgery and in the obs' crop, first of the autumn, and 2 swift flew over. Other bits included 87 ringed plover, 4 whimbrel and a single greenshank. All efforts were with sheep work through the day, and the only casual sighting of note was a kestrel at the north end. On Gretchen Loch were 3 ruff, 2 black-tailed godwit and 83 dunlin, and 2 greenshank dropped in late afternoon. A grey heron was at Hooking, 2 whimbrel along the west side, 16 bar-tailed godwit by the Shop and waders at Westness included 25 knot. The wood sandpiper was still on Bewan Loch and other waders included 21 purple sandpiper at Gue Geo, 4 whimbrel , an 2 ruff and a black-tailed godwit on Gretchen Loch. 2 grey heron were at Tor Ness and the autumn's first garden warbler was at Nether Linnay. An early icterine warbler was at Holland as was the summering chiffchaff, the first wood sandpiper of the year was on Bewan Loch and also seen were single swift and whimbrel and 4 black-tailed godwit. Very little of note but on Gretchen Loch were 41 dunlin, 2 knot and 2 black-tailed godwit. A pretty blustery day with few birds but for a passage of puffins at the north end with 1771 in an hour, meanwhile kittiwakes trickled south along the west coast with 218. Elsewhere 20 bar-tailed godwit and 2 whimbrel were by the Shop and 3 collared doves flew past Twinyas. Waders have typically seen an increase in recent days with counts of 200 sanderling, 57 ringed plover, 50 dunlin, 9 bar-tailed godwit, 2 purple sandpiper and a greenshank and 2 black-tailed Godwit recently on Gretchen Loch. Other sightings included 9 manx shearwater on 26th, 2 crossbill on 27th, a juvenile hen harrier and 3 swift on 29th plus 37 storm petrel and 4 leach's petrel trapped overnight, and the quail continued to sing by Holland. The summering chiffchaff was re-trapped at Holland, the quail was singing nearby and a basking shark was feeding off Bridesness. A whimbrel and green sandpiper were seen at the north end, the quail was heard again by Holland and just 1 crossbill remained at the airfield. 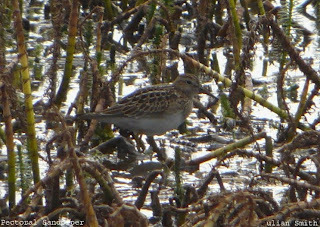 In the evening the pectoral sandpiper re-appeared on Gretchen Loch. 48 storm petrel and an impressive 6 leach's petrel were trapped overnight .